Perth, Western Australia, Thursday 24 May – A complete prototype station of antennas for the future SKA-low telescope has been completed and is being tested at the SKA site in Western Australia. 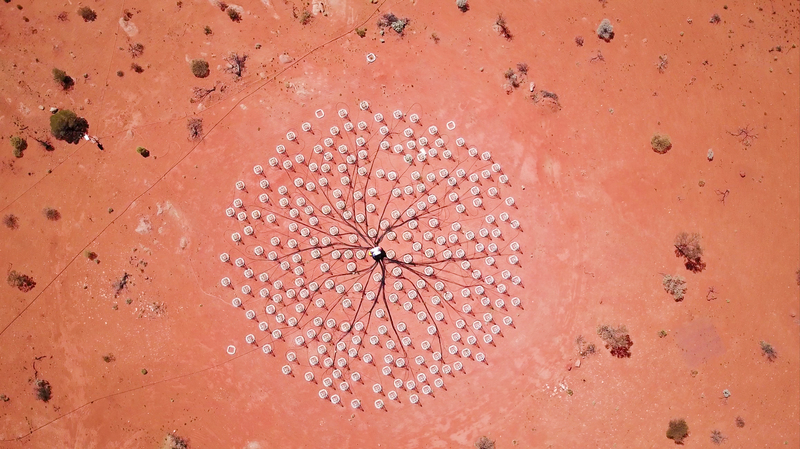 In an important engineering milestone, a full station of 256 low-frequency antennas has been deployed and is undergoing tests at CSIRO’s Murchison Radio-astronomy Observatory (MRO) in outback Western Australia. The demonstrator, known as the Aperture Array Verification System (AAVS1) is being used to help test and finalise the design of the low frequency antennas for the Square Kilometre Array (SKA), known as SKA-low. The work on AAVS1 is part of a global effort by 12 international engineering consortia representing 500 engineers and scientists in 20 countries. Nine of the consortia focus on a component of the telescope, each critical to the overall success of the project, while three others focus on developing advanced instrumentation for the telescope. After four years of intense design work, the nine consortia are having their Critical Design Review or CDR in 2018. It was installed by an international team from Australia, Italy, Malta, the Netherlands and the United Kingdom over many months, sometimes in harsh conditions. “This is a significant achievement by the team, they have done a fantastic job. We have been thinking, discussing and designing together for several years. Putting together and testing this verification system has been an amazing experience.” said AAVS1 Project Manager Pieter Benthem. Benthem is based at the Netherlands Institute for Radio Astronomy (ASTRON), the institute that leads the consortium working on the design of the SKA-low telescope. The consortium focusing on SKA-low is now working towards its critical design review later this year. “There’s still a lot of work to be done, but the lessons we’ve learnt from AAVS1 will be fed into the larger design process for SKA-low” said ICRAR Associate Professor Randall Wayth. “The antennas used for AAVS1 are what we call second generation prototypes. The tests now being conducted on them are helping predict how the fourth generation will behave. It’s all about making sure we get the best possible hardware on site at the end” explains Phil Gibbs, SKA Organisation’s Project Manager for the consortium. “The next steps will be to complete the tests, interpret the results so they can feed into the proposed design for the SKA low telescope and prepare for the critical design review, which is anticipated to take place later this year” he added. For the teams that have been involved in the work, seeing a completed prototype on site in the Australian outback is a great achievement after many years of work. “This is the first time that I’m involved in such a big project, so for me it’s a great experience” said Marco Poloni, an engineer from INAF in Italy who has been part of the installation campaign. AAVS1 is in the process of being connected to the Murchison Widefield Array (MWA), one of the four SKA precursor telescopes, which has been operational since 2013. By combining the data of the demonstrator with the MWA, the engineers will be able to fully characterise its on-sky performance. Both AAVS1 and MWA have been heavily supported by scientists, engineers and data-intensive astronomy specialists from the International Centre for Radio Astronomy Research (ICRAR) in Perth, Western Australia. The LFAA consortium is led by the Netherlands Institute for Radio Astronomy (ASTRON) and includes the International Centre for Radio Astronomy Research (ICRAR), Australia; the Key Lab of Aperture Array and Space Application (KLAASA), China; the National Institute for Astrophysics (INAF), Italy; the University of Malta; the Joint Institute for VLBI in Europe (JIVE), the Netherlands; the University of Cambridge, UK; the University of Manchester, UK; the University of Oxford, UK; the Science and Technology Facilities Council (STFC), UK; Observatoire de la Côte d’Azur, France; and Station de Radioastronomie de Nançay, France. Already supported by 10 member countries – Australia, Canada, China, India, Italy, New Zealand, South Africa, Sweden, the Netherlands and the United Kingdom – SKA Organisation has brought together some of the world’s finest scientists, engineers and policy makers and more than 100 companies and research institutions across 20 countries in the design and development of the telescope.